Garmin GPSMAP 276C is an all-in-one, versatile, colour chartplotter and automotive navigator - perfect for land or water. This portable GPS navigator features a 256-colour bright TFT display thats easy to read in bright sun along with a built-in basemap and auto routing to provide you with turn-by-turn directions to the marina for a day of boating. Garmin GPSMAP 276C has been discontinued. Released in 2017, the replacement and equalivent model to the GPSMAP 276C is the Garmin GPSMAP 276Cx. The Garmin GPSMAP 276C is an all-in-one, versatile, colour chartplotter and automotive navigator - perfect for land or water. This portable GPS navigator features a 256-colour bright TFT display thats easy to read in bright sun along with a built-in basemap and auto routing to provide you with turn-by-turn directions to the marina for a day of boating. On water, the Garmin GPSMAP 276C is a dependable, colour chartplotter with a built-in automotive basemap enhanced by Garmin's marine cartography. On land, the Garmin GPSMAP 276C Autoroute basemap features motorways and major roads. With an optional automotive kit that includes MapSource City Select software, data card, friction mount, and 12-volt power adaptor with speaker, drivers can receive voice prompted turn-by-turn directions to addresses and points of interest throughout the Europe. The Garmin GPSMAP 276C can automatically switch to Night Mode (background of the display changes from white to black) when the unit detects that the sunset time has passed. When the sunrise time has passed, the GPSMAP 276C switches back to Day Mode. While navigating a route in Automotive Mode, switch to the current Route Page to view turn-turn directions to your destination. When using the external speaker with 12-24 volt adaptor cable, the voice prompts allow you to get to your destination without taking your eyes off the road. In addition the Garmin GPSMAP 276C supports external NMEA sources for water depth, water temperature, and water speed through two serial interfaces. The GPSMAP 276C also features a new Course Deviation Indicator (CDI) - an advanced navigation tool commonly found on aircraft, but equally practical in the marine environment. The CDI quickly indicates if a boat has veered off course. For map transfer or software updates, the Garmin GPSMAP 276C features a fast USB-PC interface. The GPSMAP 276C is also powered by a rechargeable lithium-ion battery pack, or standard 240-volt AC power adaptor. 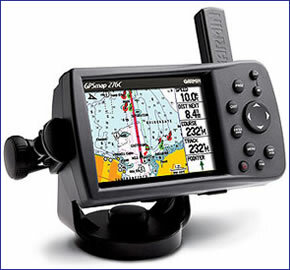 Question: Although the Garmin 276 has been discontinued is it still possible to obtain marine charts for this device? Answer: Unfortunately not, the Garmin GPSMAP 276 took the now defunct Garmin Datacards. Garmin no longer make Datacards, all of their BlueCharts are on SD/microSD Card format. This new format is not compatible with the Garmin GPSMAP 276. Do you have a question about the Garmin GPSMAP 276C? Submit your question via our contact page.